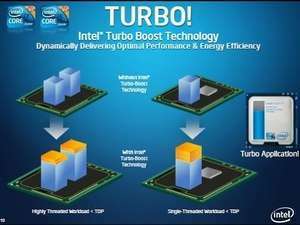 Intel Turbo Boost Technology Monitor identifies and directs workloads to the fastest core on the die first. The driver also allows for custom configuration via a whitelist that enables end users to set priority to preferred applications. The driver MUST be present on the system and configured correctly, as current operating systems cannot effectively route workloads to ordered cores. For security reasons, you should also check out the Intel Turbo Boost Technology Monitor download at LO4D.com which includes virus and malware tests. Additional screenshots of this application download may be available, too.